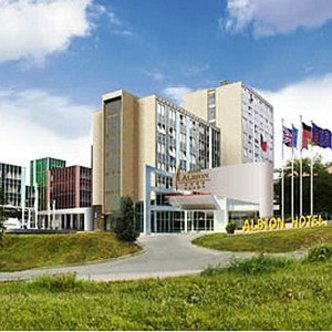 The 4star TOP Hotel Albion is located in the quite area of Pragues 5th district and surrounded by green space. The hotel offers a temporary home with 290 cosy rooms and suite-apartments. The rooms are equipped with private bathrooms/ hairdryer/ direct dial telephone/ minibar/ satellite TV/ internet access/ air-conditioning and electronic key cards. The suite-apartments consist of two separate rooms - a double bedroom and a living room with TV-Set. Enjoy culinary delights at the Grand Restaurant or taste Czech home-made specialities at the Beer Parlour. The Lobby Bar is the ideal meeting point not only for hotel guests and provides snacks and a variety of alcoholic and non-alcoholic drinks during the day. The conference centre offers 5 meeting/banquet rooms and 2 conference halls in which up to 600 persons can be accommodated in different seating forms and styles. The conference rooms are furnished with a wide range of modern technological equipment and have natural daylight. Whether for conferences/ business occasions or private functions - the 4star TOP Hotel Albion provides you with an appropriately stylish setting for any event. The wellness area will be built in the second half of the year 2006 but the beauty salon and the hotel hairdresser are on your service and an ideal place to relax. For those guests who arrive by car we offer 40 parking spaces in front of the hotel. Come and discover the city of Prague and the 4star TOP Hotel Albion.